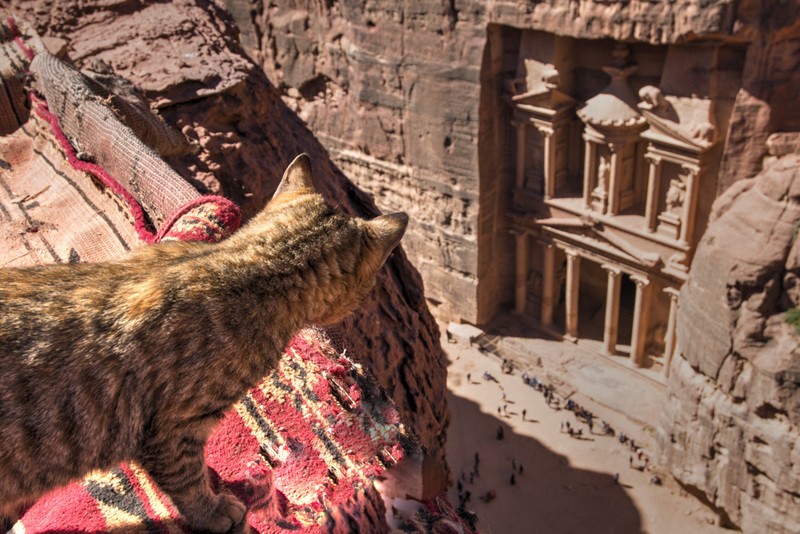 Armed with some Petra photography advice, hopefully this blog will give you some ideas to maximise your photography experience here. 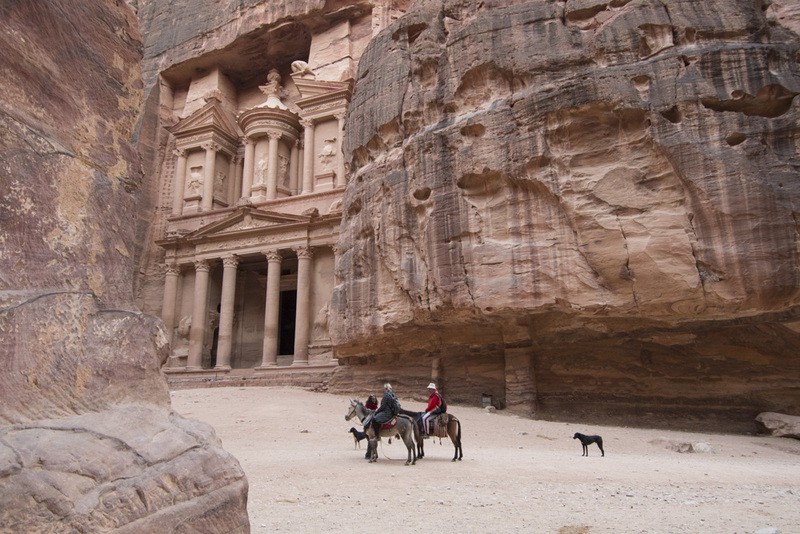 Like most iconic settings on our lovely planet Petra is definitely worth the effort to visit and I thoroughly enjoyed my recent trip. But it’s useful to know when, where and how to get away from the crowds. Make sure you’re at the entrance gate slightly before 6 am and you’ll be suprised how few people will be there. From here it’s about a 30 minute walk down and then through the rock chasm which leads to the infamous sight known as the Treasury. It will be completely in shade but you’ll have the place pretty much to yourself allowing you to bag some photos without people in the shots. 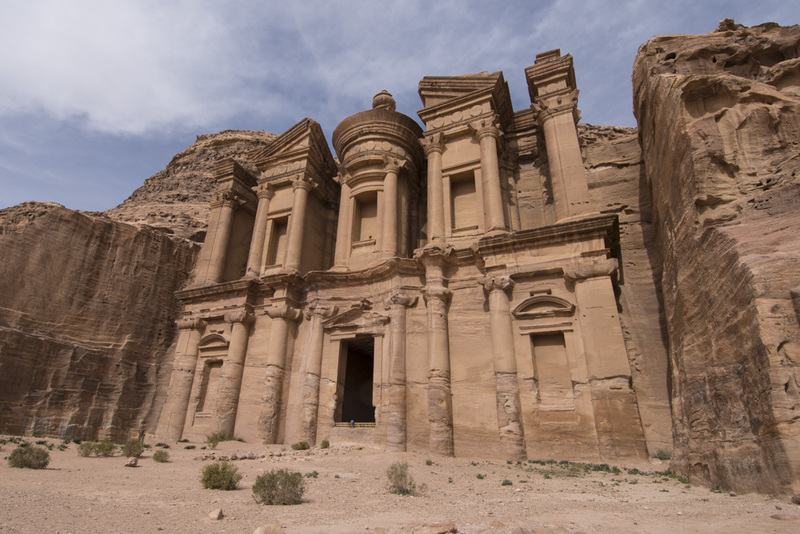 Depending on the time of year when you visit Petra the Treasury will be illuminated by sunshine somewhere between about 7.30 and 10 am. But this is also the peak time when people visit including large tour groups. However there are a couple of options to get up high which very few people bother to do. The first way is to turn left (with the Treasury facing you) and in the corner you’ll see some steps which lead up that route. Although in theory you don’t need a guide to walk up these steps a gang have got this sewn up. They can be quite aggressive and will almost certainly block your path if you attempt that route. Their starting price will be about $30 to take you on the short walk. There is another route where no guides hang out which in my opinion affords a much better vantage point. Turn right at the Treasury and follow the path down past the ampitheatre. Opposite here you’ll see a number of tombs carved out of the rock face. Cross over and walk all the way to the left of the last tomb and you’ll see steps leading up. It will take you about 40 minutes to walk up this route but it will eventually lead to a lovely view down on the treasury. A cat’s eye view down onto the Treasury from up high. Another idea for photographing the Treasury is to capture something in the foreground. There will often be camels, donkeys and of course people so use these to your advantage. Having some people in your photo is useful to give the place a sense of context as in the photo below. 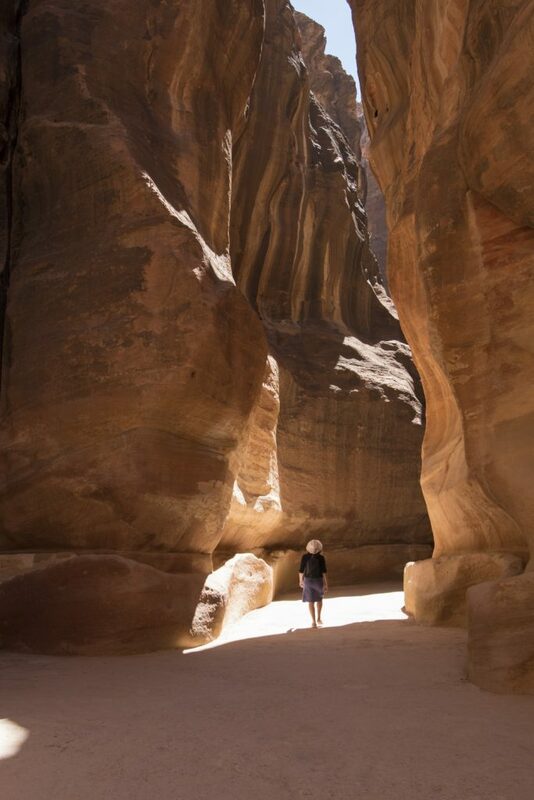 A disadvantage of getting in early is that the gorgeous rock gorge which you walk through to enter Petra will be in shade. Walk back through here later in the day and you’ll be able to photograph it with rays of light shining through. Use people to give the size a reference point. 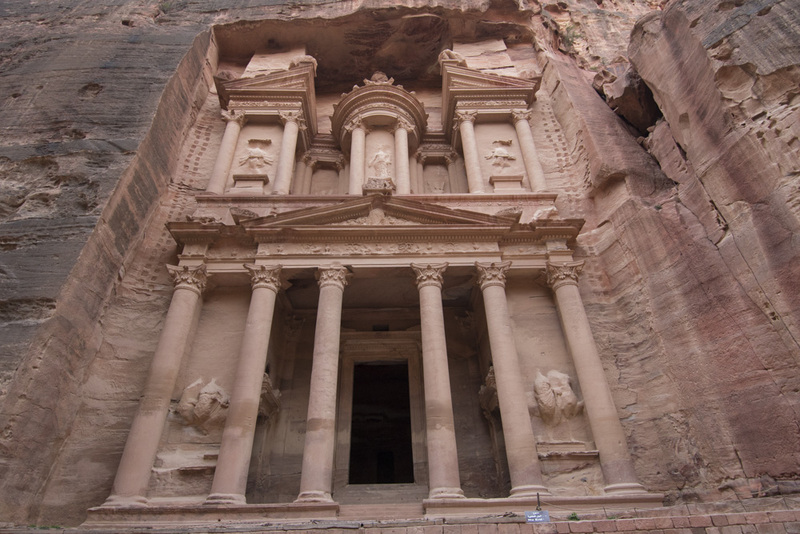 Petra covers a large area and there is so much more to it than the famous Treasury. 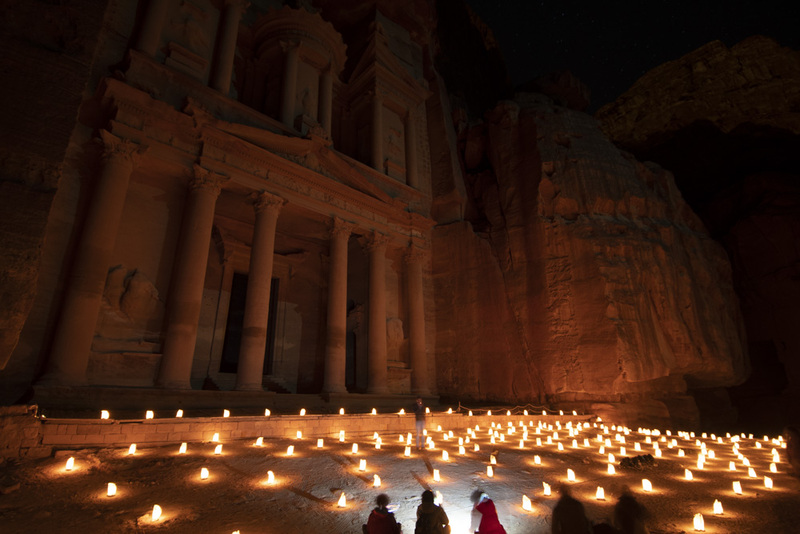 Buy a Jordon Pass which gives you three full days access to Petra at a reduced fee. You can come and go as you please if you want to exit in the heat of the day and return later. 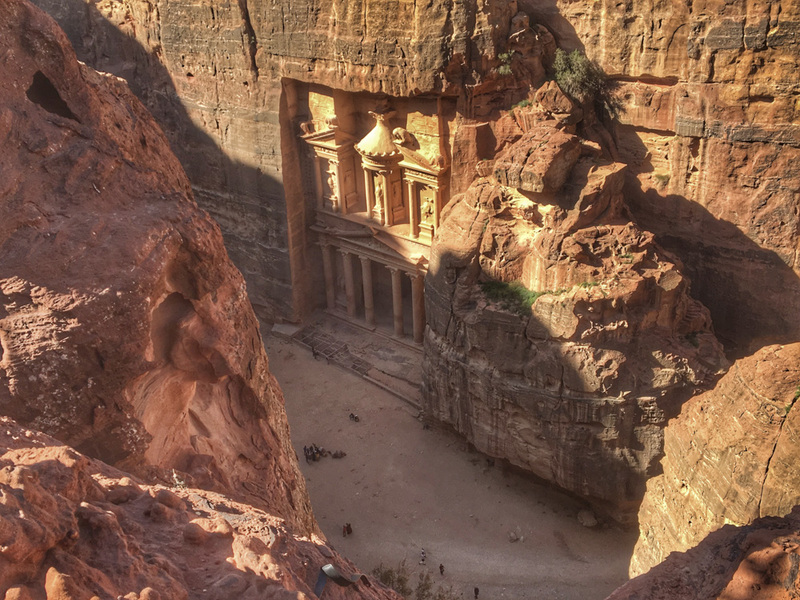 The Monastery will take you about an hour and half to walk to from the Treasury. If you take this route mid afternoon the thousands of steps will be largely in shade and by the time you reach the top the Monastery will be illuminated by sunshine. 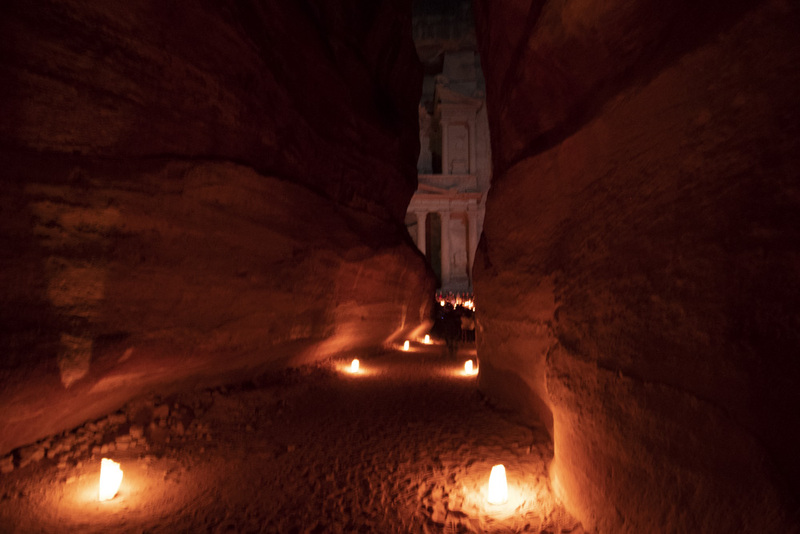 Every Monday, Wednesday and Thursday both the route to Petra and the Treasury are lit by thousands of candles. It costs about an extra $20 to do this with the gate opening at 8.30 pm. The key here is to be one of the first people in. I got there at 8 pm and there were about ten people ahead of me in the queue. This means you’ll have the route largely to yourself along with the best view of the Treasury before the crowds arrive. The actual ‘show’ at the Treasury starts about 9 pm and is dreadful. When I was here it consisted of three people playing out of tune whistles ! My advice is to get in first and then leave by 9.15 pm and then you’ll be able to walk back through the candle lit gorge without many people. Unless you like out of tune whistles of course ? 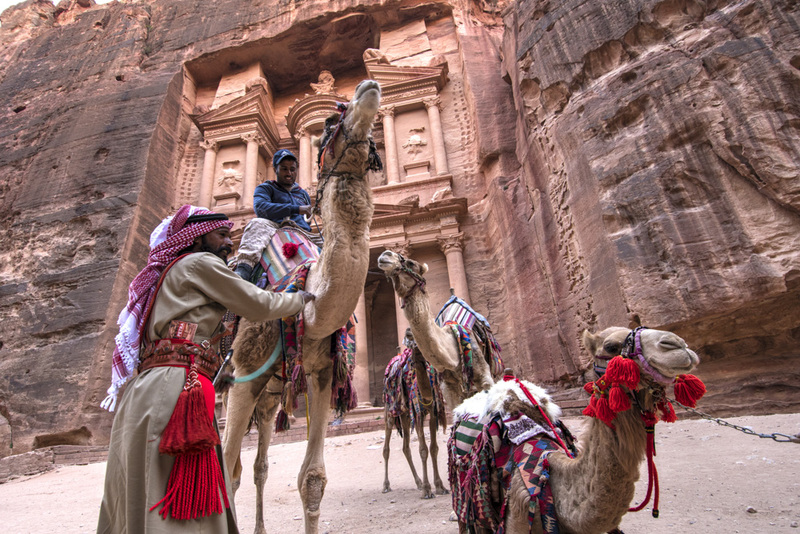 There’s a wealth of options to stay near Petra from expensive hotels in town to Bedouin camps in the desert. I stayed at the lovely Seven Wonder’s Bedouin camp which I thoroughly recommend. Great value, very friendly and yummy food.